DeKalb’s VOICE contributes to our community by supporting educational and significant needs. 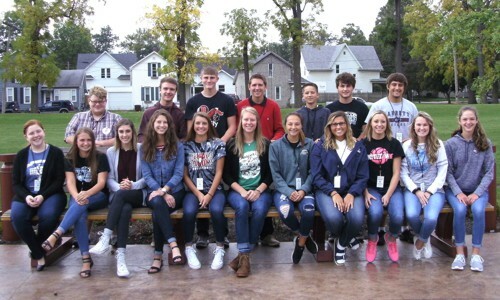 The Community Foundation’s youth philanthropy group, DeKalb’s VOICE, is a grant making advisory group with fourteen student members. VOICE meets once a month during the school year to learn about the community and its charitable needs. DeKalb’s VOICE has members from DeKalb, Eastside, Garrett and Lakewood Park Schools. The students are grade 9 through grade 12. Once appointed, each student serves on the group through his/her high school graduation. The Dekko Foundation and Community Foundation DeKalb County sponsor DeKalb’s VOICE, working together to grow a new generation of philanthropic leaders. Front Row: Addeline Kruse, Emily Silver, Libbey Detcher, Claire Comfort, Olivia Fetter, Aspen Pflughoeft, Maddisyn Heffley, Rachel Shultz, Julia Baker, Annaliese Pfeffer and Sarah Cooper. DeKalb’s VOICE grants support a wide variety of charitable needs in DeKalb County, Indiana. VOICE also accepts proposals from student-led school organizations. Grants to individuals or for school trips or proms/dances are typically not funded. When can I apply for a VOICE grant? The grant proposal deadline is November 7 and February 28 of each year. A grant proposal form should be completed on the computer using the preset margins and font size. Handwritten proposals are not accepted. Submit an electronic copy of your proposal documents before the deadline to Ashton Willis. If this is your organization’s first grant proposal to DeKalb’s VOICE, include a copy of your organization’s 501(c)3 designation letter. Note – We often have technical difficulties with .pdf files saved on a Macintosh computer. If you submit your application with a Mac we may contact you for a paper copy. To prevent possible software glitches, please update your Adobe Reader software to the latest version. This is a free download at www.adobe.com. What is the grant proposal process? Grant proposals are submitted to Community Foundation DeKalb County’s office. VOICE members evaluate the proposals against their mission and grant focus then make funding recommendations to the foundation’s Board of Directors. Once grant decisions are made, notification letters are sent to all applicants. This process takes approximately 45 days, so please plan accordingly to make sure the timeline fits your program’s needs. Contact Ashton Willis at the Community Foundation DeKalb County office (260) 925-0311 or email. Download this two-page form to apply for a grant by using Adobe Acrobat. Once filled out, email it to Ashton Willis. Grant proposal deadlines are November 7 and February 28. This form gives you an opportunity to share information and reflect on your successes or challenges. It gives the foundation a better understanding of your organization and your programs and projects.